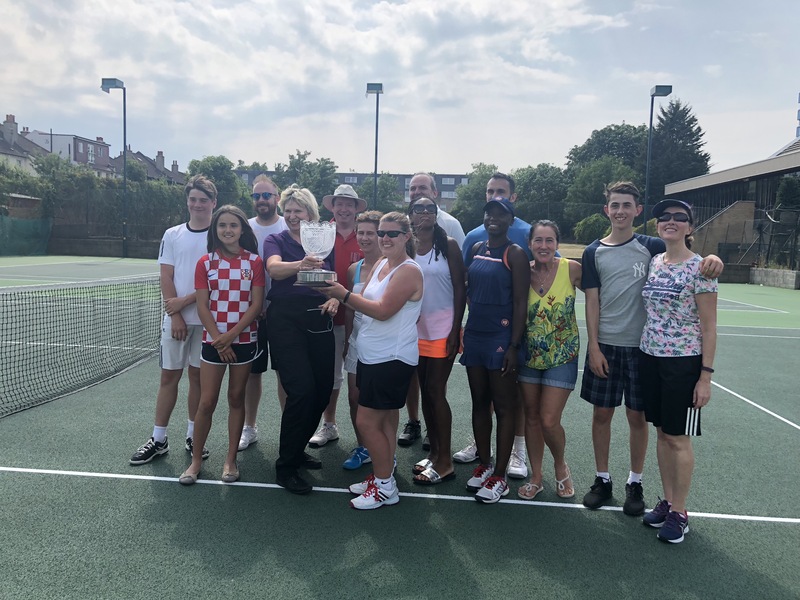 Norbury Park lifted the Millennium Cup trophy in 2018, 16 years after their last win and in their third consecutive final, defeating Telford Park, 6-3, at home on Sunday 1 July, the day before The Championships at Wimbledon. The first round ended at two rubbers apiece, after which Norbury pulled ahead. The boy’s match was very close, with Norbury’s Mark Lovejoy evenly matched with George Prest from Telford. Mark eventually pipped George 10-4 in the match tiebreak. On court 2, Telford’s Sally Binny and Charmaine Boyd from Norbury fought another very close battle, with Sally winning 11-9, also in the match breaker. 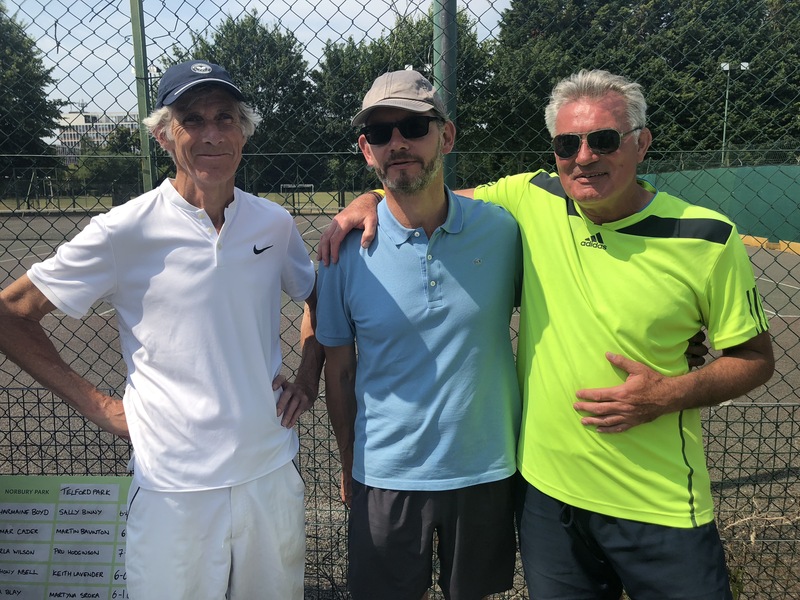 The two men’s singles matches went one apiece, with Norbury’s vet Anthony Abell out-smarted by Keith Lavender from Telford, and Omar Cader from Norbury defeating Martin Bavington. Norbury clinched the trophy in round two, with strong performances from their women in the girls, ladies vets, and ladies doubles. In the girls rubber, Norbury’s ‘Pocket Rocket’ Nina Blay defeated Martyna Sroka in a much closer match than the scoreline suggested, Carla Wilson (NP) defeated Pro Hodkinson (TP), and the ladies doubles went to Norbury’s Thelma Ziervogel and Carla Watson, defeating Ellen Hoyle and Kate Sheehy from Telford. 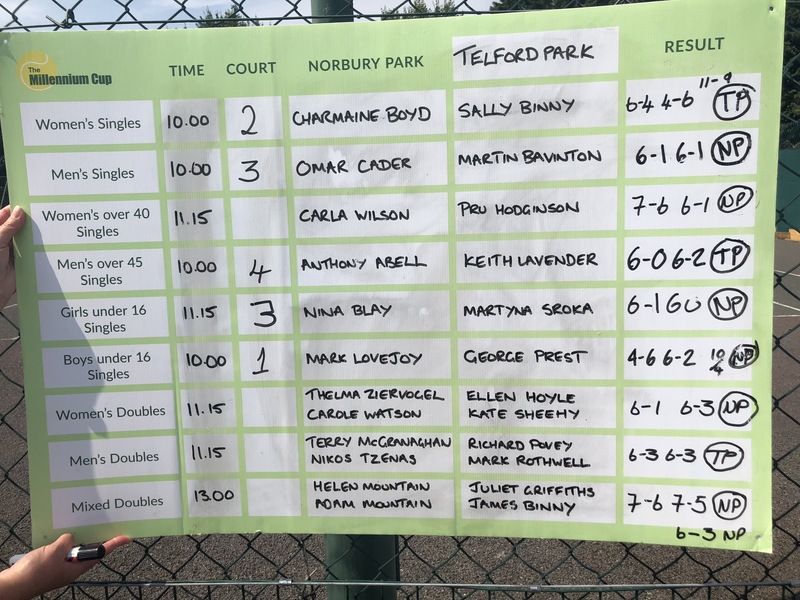 The mixed doubles match, always challenging when a ‘dead’ rubber, was won by Norbury’s mother and son combination of Helen and Adam Mountain (Adam currently a ball boy at Wimbledon), defeating Telford’s Juliet Griffiths and James Binny. 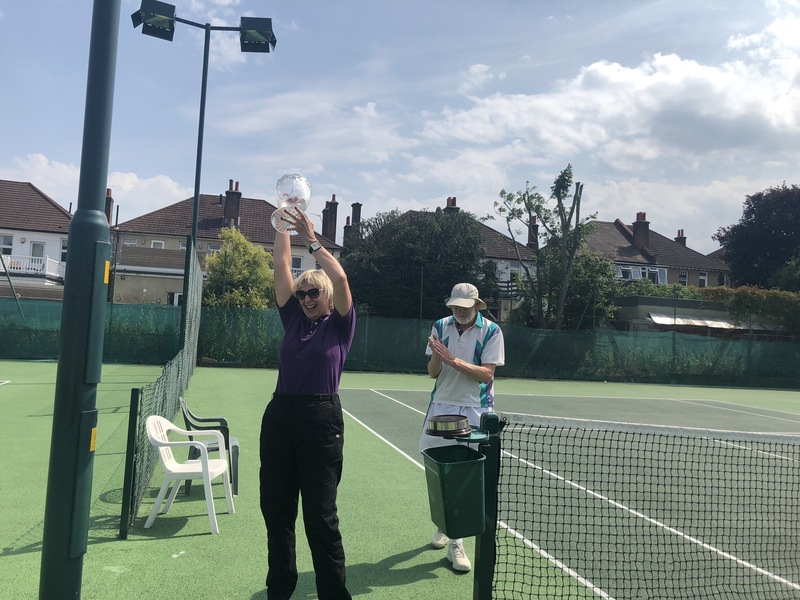 Norbury’s captain, Lisa Patient, arrived just in time from her driving shift at Wimbledon to receive the trophy, which was presented in fine style by Murray Sutton, Chairman of the Organising Committee. Women’s Singles: Charmaine Boyd lost to Sally Binny, 6-4 4-6 [11-9]; Men’s Singles: Omar Cader d Martin Bavinton, 6-1 6-1; Women’s Over 40 Singles: Carla Wilson d Pru Hodgkinson, 7-6 6-1; Men’s Over 45 Singles: Anthony Bell lost to Keith Lavender, 6-0 6-2; Girls Under 16 Singles: Nina Blay d Martyna Sroka, 6-1 6-0; Boys Under 16 Singles: Mark Lovejoy d George Prest, 4-6 6-2 [10-4]; Women’s Doubles: Thelma Ziervogel & Carole Watson d Ellen Hoyle & Kate Sheehy, 6-1 6-3; Men’s Doubles: Terry McGranaghan & Nikos Tzenas lost to Richard Povey & Mark Rothwell, 6-3 6-3; Mixed Doubles: Helen Mountain & Adam Mountain d Juliet Griffiths & James Binny, 7-6 7-5.